Perhaps you are familiar with what long term care is, or have a loved one who required assistance. Today there are many ways to help you, and those you care about plan ahead - and be prepared if a need for care arises. Essentially, when you have a plan for care, you can be better equipped to handle the emotional upheaval, physical challenges, and the extensive financial commitment a need for care can require. Today we are living longer than ever before, and the longer we live the greater chance we’ll find ourselves, or those we care about needing care. Although at LTCi Marketplace we’ve never been a fan of statistic’s, depending upon whose research you review, you’ll find that simply by attaining age 65 there is a 60 to 70% chance you’ll need some sort of care. Sadly, accident and illness know no boundaries when coming home to roost, and until you are prepared with a plan, the simple truth is you are opting to self-fund these outlays – which can place a lifetime of financial achievement in jeopardy, or future funding needs for retirement at risk. In our eyes, the greatest misconception about long term planning is that it is age based, as opposed to being viewed as a wealth protection tool. What few realize is that of those currently receiving care, nearly 40% are under the age of 65. Generally, most all of our clients are glad to self-fund some portion of potential expenses associated with needing care. At LTCi Marketplace, we take great pride in developing plans for care that can ultimately help provide you, and those you care about with greater peace of mind – and are affordable too. A significant part of our process in designing thoughtful and comprehensive plans, is asking those who come to us for guidance, to have a heartfelt conversation with those they care about, to determine where you or they would like to receive care, be that at home, or in a community or facility that caters to such needs. Further, what amount would be an affordable contribution each month toward your care, if said need lasted four to five years or longer – and where might those monies come from. Today, there are more options than ever before to plan for care, as companies have stepped to the forefront with new offerings - that can help us to help you design a plan that meets your goals and objectives, and is within your budget. Today you can secure a stand-alone long term care policy, or life insurance that provides access to your death benefit for care prior to passing away, and lets’ you leave any unspent monies to beneficiaries of your choice. 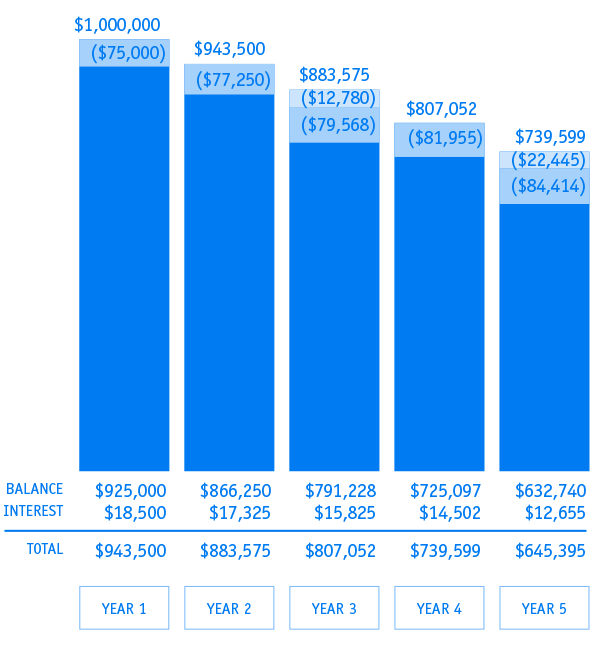 These options also include one-time payment plans, or plans that can be paid for over a specified number of years. Speaking of choices, among these are the length of time you want to receive a monies toward your care, such two years, three years, five years or more. Today, all policies are built around a pool of money to be spent as you see fit, in a care setting of your choice, receiving care by who you want, be that from professional care givers and companions – or in concert with family members. One other consideration is when do you want your policy to begin paying you a benefit, such as from day one for home care, or other options such as 60 or 90 days from when your need for care begins. The industry refers to this as an elimination period, where you’ll be personally responsible for your cost of care. Another piece of the puzzle is protecting yourself not just for today, but for care that is hopefully many years down the road. Depending upon your age and needs, we believe having your pool of money grow with some sort of inflation protection is important. This way a $150.00 per day benefit can grow over the next 15 to 20 years to $300.00 per day, or in actuality doubling from $4,500 to $9,000 per month. Other popular riders include shared care, which allows a spouse or partner to share your pool money should they exhaust their benefit, and this rider also allows the partner or spouse to inherit any unused portion of the other’s policy upon their death. In addition, one can include spousal waiver of premium, so if one of two people is on claim, the other pays no premium until that individual receiving benefits recovers or passes away. Some companies also offer a restoration of benefits rider, which provides that if you were to go on claim and recover, and then not need services for a period of six months, your pool of money restores itself to the original face amount, as if you never received any money from your policy. The last rider I’ll mention, is a survivorship rider, this provides that if a couple were to purchase identical policies, and own them for what is usually a 10 year period without being on claim, when one of the two passes away, the remaining spouse pays no more premiums. Click here to see a real life example of what the costs of long term care can be. We invite you to call or email us, as we welcome being a helpful resource, be that to review existing coverage and policies you may have purchased many years ago – or to explore designing a customized plan that is right for you, based upon what you are trying to achieve. • Home care begins in year one at $23.00 per hour for eight hours per day, seven days per week, and utilizes a 3% annualized compound inflation factor. For year two we assume 12 hours of care per day at $23.69 per hour, and in year three we provide for 16 hours of care per day at $24.40 per hour. • In year four we anticipate this individual moving to an assisted living community at a cost of $6,000 per month for one year. • In year five, we provide for care within a nursing home setting with an outlay of $12,000 per month for one year. • An after tax annual household expense budget of $75,000 that grows at a compound inflation factor of 3%. 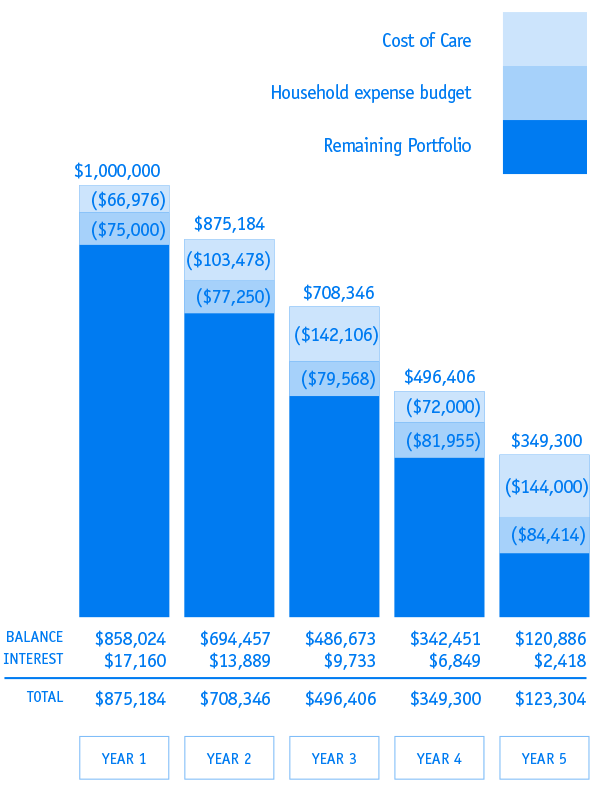 • The remaining liquid investable portfolio asset base earns an annualized net return of 2%. • The net result of the aforementioned spend down for care, and household expenses from the $1,000,000 results in a remainder of $123,304 after five years. Starting with the same $1,000,000 liquid asset base, and identical assumptions as above, with the only difference being this individual had long term care insurance in place prior to their need for care, that initially reimburses up to $9,000 per month toward any need for care. This policy includes home care from day one, along with five years of coverage [or more depending upon how quickly you choose to spend down your pool of money], and 3% compound inflation protection that is added to your monthly benefit pool on each policy anniversary. The only years that require any personal contribution toward care are in year three, in the amount of $12,780 and in year five, in the amount of $22,445 and in this illustration, the policy actually provides for care beyond five years. Also of note, is that the annual long term care insurance premium is built into the household expense budget, and even more important is when the insured individual begins receiving benefits, there are no more premiums due [and depending how the policy is designed, this can also apply to the healthier spouse who is not on claim]. By having insurance, the net result of the aforementioned spend down for care and household expenses from the $1,000,000 results in a remainder of $645,395. Please note that the above expenditures are a representation, and can change depending upon the level of care selected, and where that care is delivered. As an example, a registered nurse is significantly more expensive than a home health aide, and these hourly fees can vary widely by community and state. All policies will pay a benefit once an insured qualifies to be on claim in each of the 50 states, regardless of where the original policy was purchased.